Not to be confused with Rosacea. Rosaceae, the rose family, is a medium-sized family of flowering plants, including 4,828 known species in 91 genera. The name is derived from the type genus Rosa. Among the most species-rich genera are Alchemilla (270), Sorbus (260), Crataegus (260), Cotoneaster (260), Rubus (250), and Prunus (plums, cherries, peaches, apricots, and almonds) with about 200 species. However, all of these numbers should be seen as estimates – much taxonomic work remains. The family Rosaceae includes herbs, shrubs, and trees. Most species are deciduous, but some are evergreen. They have a worldwide range, but are most diverse in the Northern Hemisphere. Several economically important products come from the Rosaceae, including many edible fruits (such as apples, pears, quinces, apricots, plums, cherries, peaches, raspberries, loquats, and strawberries), almonds, and ornamental trees and shrubs (such as roses, meadowsweets, photinias, firethorns, rowans, and hawthorns). The Rosaceae have a cosmopolitan distribution (found nearly everywhere except for Antarctica), but are primarily concentrated in the Northern Hemisphere in regions that are not desert or tropical rainforest. The family was traditionally divided into six subfamilies: Rosoideae, Spiraeoideae, Maloideae (Pomoideae), Amygdaloideae (Prunoideae), Neuradoideae, and Chrysobalanoideae, and most of these were treated as families by various authors. More recently (1971), Chrysobalanoideae was placed in Malpighiales in molecular analyses and Neuradoideae has been assigned to Malvales. Schulze-Menz, in Engler's Syllabus edited by Melchior (1964) recognized Rosoideae, Dryadoideae, Lyonothamnoideae, Spireoideae, Amygdaloideae, and Maloideae. They were primarily diagnosed by the structure of the fruits. More recent work has identified that not all of these groups were monophyletic. Hutchinson (1964) and Kalkman (2004)  recognized only tribes (17 and 21, respectively). Takhtajan (1997) delimited 21 tribes in 10 subfamilies: Filipenduloideae, Rosoideae, Ruboideae, Potentilloideae, Coleogynoideae, Kerroideae, Amygdaloideae (Prunoideae), Spireoideae, Maloideae (Pyroideae), Dichotomanthoideae. A more modern model comprises three subfamilies, one of which (Rosoideae) has largely remained the same. While the boundaries of the Rosaceae are not disputed, there is not general agreement as to how many genera it contains. Areas of divergent opinion include the treatment of Potentilla s.l. and Sorbus s.l.. Compounding the problem is that apomixis is common in several genera. This results in an uncertainty in the number of species contained in each of these genera, due to the difficulty of dividing apomictic complexes into species. For example, Cotoneaster contains between 70 and 300 species, Rosa around 100 (including the taxonomically complex dog roses), Sorbus 100 to 200 species, Crataegus between 200 and 1,000, Alchemilla around 300 species, Potentilla roughly 500, and Rubus hundreds, or possibly even thousands of species. The sister relationship between Dryadoideae and Rosoideae is supported by the following shared morphological characters not found in Amygdaloideae: presence of stipules, separation of the hypanthium from the ovary, and the fruits are usually achenes. The sister relationship between Amygdaloideae and Dryadoideae is supported by the following shared biochemical characters not found in Rosoideae: production of cyanogenic glycosides and production of sorbitol. Rosaceae can be trees, shrubs, or herbaceous plants. The herbs are mostly perennials, but some annuals also exist. The leaves are generally arranged spirally, but have an opposite arrangement in some species. They can be simple or pinnately compound (either odd- or even-pinnate). Compound leaves appear in around 30 genera. The leaf margin is most often serrate. Paired stipules are generally present, and are a primitive feature within the family, independently lost in many groups of Amygdaloideae (previously called Spiraeoideae). The stipules are sometimes adnate (attached surface to surface) to the petiole. Glands or extrafloral nectaries may be present on leaf margins or petioles. Spines may be present on the midrib of leaflets and the rachis of compound leaves. Flowers of plants in the rose family are generally described as "showy". They are actinomorphic (i.e. radially symmetrical) and almost always hermaphroditic. Rosaceae generally have five sepals, five petals, and many spirally arranged stamens. The bases of the sepals, petals, and stamens are fused together to form a characteristic cup-like structure called a hypanthium. They can be arranged in racemes, spikes, or heads; solitary flowers are rare. The fruits occur in many varieties and were once considered the main characters for the definition of subfamilies amongst Rosaceae, giving rise to a fundamentally artificial subdivision. They can be follicles, capsules, nuts, achenes, drupes (Prunus), and accessory fruits, like the pome of an apple, or the hip of a rose. Many fruits of the family are edible, but their seeds often contain amygdalin, which can release cyanide during digestion if the seed is damaged. Subfamily Rosoideae: Traditionally composed of those genera bearing aggregate fruits that are made up of small achenes or drupelets, and often the fleshy part of the fruit (e.g. strawberry) is the receptacle or the stalk bearing the carpels. The circumscription is now narrowed (excluding, for example, the Dryadoideae), but it still remains a diverse group containing five or six tribes and 20 or more genera, including rose, Rubus (blackberry, raspberry), Fragaria (strawberry), Potentilla, and Geum. Subfamily Amygdaloideae: Within this group remains an identified clade with a pome fruit, traditionally known as subfamily Maloideae (or Pyroideae) which included genera such as apple, Cotoneaster, and Crataegus (hawthorn). To separate it at the subfamily level would leave the remaining genera as a paraphyletic group, so it has been expanded to include the former Spiraeoideae and Amygdaloideae. The subfamily has sometimes been referred to by the name "Spiraeoideae", but this is not permitted by the International Code of Nomenclature for algae, fungi, and plants. Subfamily Dryadoideae: Fruits are achenes with hairy styles, and includes five genera (Dryas, Cercocarpus, Chamaebatia, Cowania, and Purshia), most species of which form root nodules which host nitrogen-fixing bacteria from the genus Frankia. The rose family is arguably one of the six most economically important crop plant families, and includes apples, pears, quinces, medlars, loquats, almonds, peaches, apricots, plums, cherries, strawberries, blackberries, raspberries, sloes, and roses among the crop plants belonging to the family. Many genera are also highly valued ornamental plants. These include trees and shrubs (Cotoneaster, Chaenomeles, Crataegus, Dasiphora, Exochorda, Kerria, Photinia, Physocarpus, Prunus, Pyracantha, Rhodotypos, Rosa, Sorbus, Spiraea), herbaceous perennials (Alchemilla, Aruncus, Filipendula, Geum, Potentilla, Sanguisorba), alpine plants (Dryas, Geum, Potentilla) and climbers (Rosa). However, several genera are also introduced noxious weeds in some parts of the world, costing money to be controlled. These invasive plants can have negative impacts on the diversity of local ecosystems once established. Such naturalised pests include Acaena, Cotoneaster, Crataegus, Pyracantha, and Rosa. The Rosaceae family covers a wide range of trees, bushes and plants. ^ a b Takhtajan A. (1997). Diversity and Classification of Flowering Plants. New York: Columbia University Press. pp. 1–620. ISBN 978-0231100984. 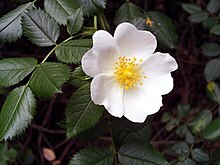 ^ "The Plant List: Rosaceae". Royal Botanic Gardens, Kew and Missouri Botanic Garden. Retrieved 20 November 2016. ^ a b c "Angiosperm Phylogeny Website". mobot.org. ^ Bortiri, E.; Oh, S.-H.; Jiang, J.; Baggett, S.; Granger, A.; Weeks, C.; Buckingham, M.; Potter, D.; Parfitt, D.E. (2001). "Phylogeny and Systematics of Prunus (Rosaceae) as Determined by Sequence Analysis of ITS and the Chloroplast trnL–trnF Spacer DNA". Systematic Botany. 26 (4): 797–807. JSTOR 3093861. ^ a b c d Watson, L.; Dallwitz, M.J. (1992). The families of flowering plants: Descriptions, illustrations, identification, and information retrieval. Version: 21 March 2010. delta-intkey.com. ^ Caratini, Roger. La Vie de plantes. 1971. Encyclopédie Bordas. ^ Lawrence, G.H.M. 1960. Taxonomy of Vascular Plants. Macmillan. ^ Schulze-Menz GK. (1964). "Rosaceae". In Melchior H. Engler's Syllabus der Pflanzenfamilien. II (12 ed.). Berlin: Gebrüder Borntraeger. pp. 209–218. ^ Hutchinson J. (1964). The Genera of Flowering Plants. 1, Dicotyledons. Oxford: Clarendon Press. pp. 1–516. ^ Kalkman C. (2004). "Rosaceae". In Kubitzki K. Flowering plants—Dicotyledons: Celastrales, Oxalidales, Rosales, Cornales, Ericales. The Families and Genera of Vascular Plants. 6 (1 ed.). Berlin Heidelberg: Springer-Verlag. pp. 343–386. doi:10.1007/978-3-662-07257-8. ISBN 978-3-540-06512-8. ^ Evans R. (1999). "Rosaceae Phylogeny: Origin of Subfamily Maloideae". Rosaceae Phylogeny and Evolution. Botany Department, University of Toronto. Retrieved July 7, 2017. ^ "Rosaceae Juss. : FloraBase: Flora of Western Australia". calm.wa.gov.au. ^ Beentje, H. (2010). The Kew Plant Glossary, an Illustrated Dictionary of Plant Terms. Kew, London, U.K.: Kew publishing. ISBN 978-1-842-46422-9.